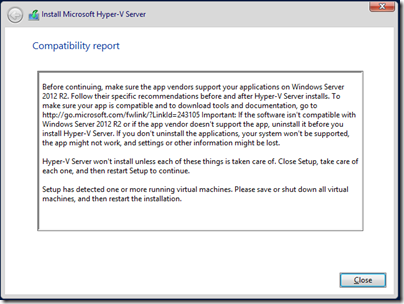 I have two servers running Hyper-V, which I have just upgraded to Hyper-V Server 2012 R2. 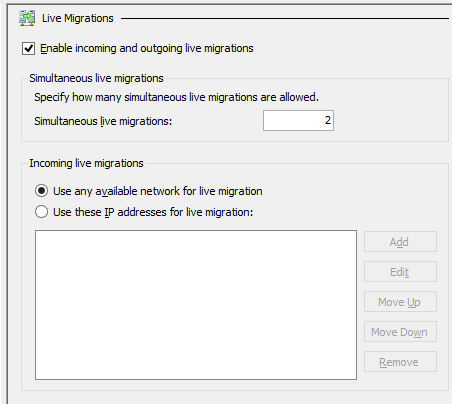 I thought it was time to test live migration. I have a VM which runs ISA server 2004. It is connected to two virtual switches, one for the internal network, and one for the external network. Both servers have two identically named virtual switches. I ran into all the errors. 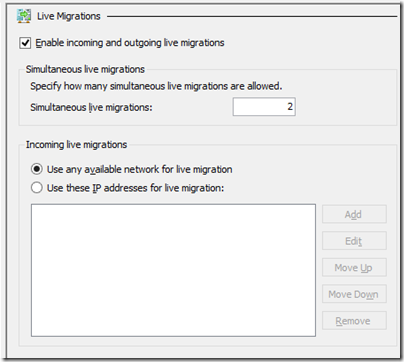 First, I just checked the box for Enable incoming and outgoing live migrations for Hyper-V on each box. Then I tried to move the VM. I got the error described here: The credentials supplied to the package were not recognized. Next, you have to go into Active Directory and set up Delegation using Kerberos for several services: cifs, and Microsoft Virtual System Migration Service. There is a screengrab in the comments here. 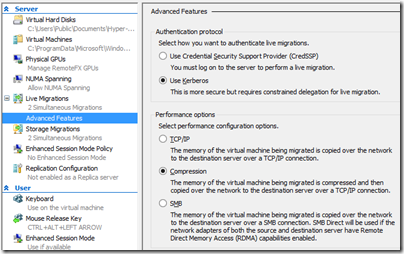 Do this for both (or all) the servers you want to participate in Live Migration. I retried the move. Still no go; I got a General Access Denied error 0×80070005 when the source server tried to create a temp folder on the destination server. 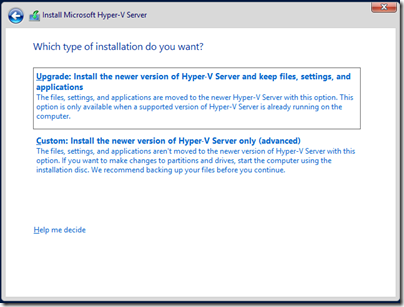 The fix, it turned out, was to add the domain administrator to the local Hyper-V group Hyper-V Administrators. You can do this with PowerShell as explained (in generic terms) here. Then reboot the source server. I retried the move operation. It worked. The funny thing: all my internet traffic goes through this VM. I use the internet constantly, but did not notice any downtime as the VM moved from one host to the other. When I remembered I checked and found that the VM had indeed moved. My question though: why is it that getting this stuff working always seems to involve several steps (in this case Active Directory, Advanced Feature settings, and of course reboot) that are barely documented? 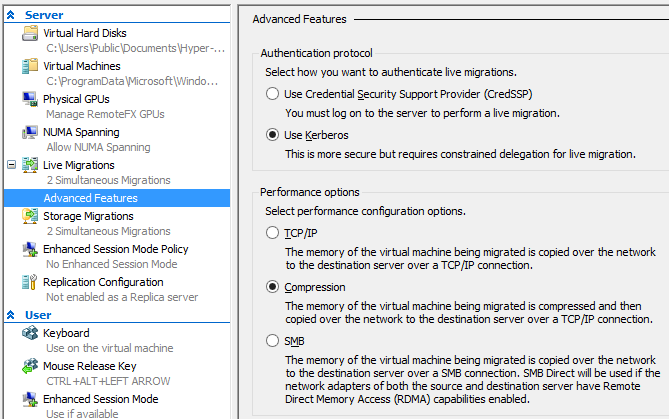 Why can’t some wizard check the settings for you when you enable Live Migration and offer to fix them or at least tell you what to do? Nevertheless, once you get it working this is impressive, especially considering that I have no shared storage nor System Center VMM. What to do if SkyDrive disappears from Windows 8.1 Explorer? Here is the scenario. You are working away in Windows 8.1 and want to save a document to SkyDrive. You look for the SkyDrive link in Windows Explorer but it is not there. Still, that is inconvenient. How can you restore the Explorer link, other than by rebooting and hoping it reappears? and press Enter. You don’t need to run the command prompt with administrator rights. What if it doesn’t? Now you have to check the logs or event viewer and look for specific errors. But the simple technique described first has always worked for me. Microsoft delivered record revenue of $18.53 billion in the quarter ended September 30th 2013 – which might come as a surprise if you have been focusing on the companies failings in tablets and smartphones versus Apple and Android, the steep decline in PC sales, and its small market share in search versus Google, but less so if you have been watching the advance of products like Office 365, Windows Azure, SQL Server and Windows Server, all of which have been making good progress. In its report, the company says the Windows OEM revenue declined 7% (reflecting PC malaise) but Surface revenue grew to $400 million. Search advertising revenue grew 47% reflecting some degree of success for Bing. Commercial cloud revenue grew 103%, though bear in mind that Microsoft is not telling us the absolute figures; you can easily grow fast if you start from a small number. From this you can see that despite 103% growth, Azure and Office 365 remain relatively small, many times exceeded by the on-premise software licensing which is mainly in “Commercial Licensing”. However Microsoft is reporting a contribution to profits from this segment, though with smaller margins than from software licensing. Simple addition also tells us that consumer revenue ($7,463 million) is less than business revenue ($11,197 million). Overall it is obvious that Microsoft is not yet a “devices and services” company even if it has set that as its goal. Most of its revenue comes from traditional software licensing. Can it ever make that transition without shrinking in the process? A good question, and despite excellent figures, one that will ensure Microsoft’s future remains the subject of intense debate. Who cares about cameras on a tablet? Not many perhaps, though I regularly see iPads held aloft. Microsoft’s Surface RT has two cameras, both 720p (1280 x 720 or about 0.9MP). Surface 2 also has two cameras, the rear 5MP and the front 3.5MP. I found the Surface RT rear camera so disappointing that I never used it, but the one on Surface 2 is rather good. Here is a quick snap of a similar scene taken with each device. After a day or two with Surface 2 and the Touch 2 keyboard, a few thoughts. First, I am typing this on my desktop PC. I would have used the Surface 2, as I like to match the tool to the review, but no Live Writer on Surface (my favoured blog authoring tool) and no, Word is not as good for this. That neatly demonstrates the app issue on Windows RT; but despite that I expect to use Surface 2 frequently in the coming months. It is an excellent tablet, with its chief advantages over the older Surface being performance and Windows 8.1, which includes Outlook. Performance on Surface 2 is around 4 times faster for graphics – see previous post – and more than twice as fast in general. The touch keyboard, now with backlighting, is also much improved. I know I am in a minority here, but to me the Windows RT concept makes good sense. A locked-down version of Windows that is almost legacy-free, though it is still Windows and capable of throwing up mystifying dialogs and hiding settings in strange places. It seems to me that if there is any hope for the Windows 8 app ecosystem, then it will be driven by tablets like this one, and Nokia’s new Lumia 2520 which also runs Windows RT. Desktop users are mostly ignoring the app platform. There are a few signs of life, like the new Facebook app, and things like Xbox Music are now decent. MediaMonkey, which I like for its Flac support, runs nicely on Surface 2. Isn’t an iPad Air better? In some ways for sure. Usability, performance, size and weight, and rich app availability are all in the iPad’s favour, and price is similar. The reason you might get a Surface though is for Office, USB 3.0, HDMI out, SD card, and the clever keyboard cover. I also like having more than one app to view, whether that is Word and Excel on the desktop, or Word and Caculator, or the split view that works in the new app world. I’ve hit a few snags with Surface 2. Sound is less good than on Surface RT, tending to be thin and reedy, unless you use headphones or external speakers. The Touch 2 keyboard sometimes stops responding, which I hope is a driver issue (perhaps the update downloaded this morning will fix it). I also suspect that build quality on Surface 2 falls short of Surface RT. It is still “Vapor Mg” but I already have a slight dent in the bezel on mine whereas on my old RT it is still perfect and I wonder if it is thinner. The extra price for the 64GB vs 32GB SSD is absurd. Why not make them all 64GB and increase the price by a fraction? Is Microsoft serious about selling Surface 2? There does not seem to be much stock around, and it is not yet listed on Amazon.co.uk, although it has been on sale since yesterday. Those that do discover it will like it, provided they understand the difference between Windows RT and Windows x86, something which – bizarrely – Microsoft still seems keen to disguise. We know that the new Surface 2 (Nvidia Tegra 4) is faster than the old Surface RT (Tegra 3) but by how much? I came across the FutureMark 3D Benchmark for Windows RT in the Windows Store and tried it on both. Surface 2 reported “Maxed out” on the scores. However, on the next test, Ice Storm Extreme, I got a result. 3D Mark RT says my score is “low for this device” on Surface RT, but “a great score for this device” on Surface 2. Maybe the impact of Windows RT 8.1? Bottom line: on these tests Surface 2 is around 4 times faster. No wonder it feels snappier to use. Nokia’s former CEO Stephen Elop has announced the Lumia 2520 tablet ($499) running Windows RT, at an event in Abu Dhabi. The 10.1″ tablet comes with Qualcomm Snapdragon 800 (quad-core 2.2 Ghz) chipset and LTE connectivity – unlike Microsoft’s Surface, which is wifi only. It will ship this year. The screen has high brightness and low reflectivity, which apparently enables reading or videos in bright sunlight as well as in low light. The camera hardware includes Zeiss optics, 6.7MP rear camera, 2MP front camera. Fast charging gets it to 80% charged in one hour, according to Nokia. The Nokia Power Keyboard accessory offers up to 5 hours added battery life and two USB ports. It forms a cover as well as a keyboard, and includes a trackpad. As with other Windows RT devices, Microsoft Office is included. On the app side, Nokia showed two of the same apps just announced for its Lumia Windows Phones, the Nokia Camera app and the Storyteller app. The Storyteller app integrates photos and mapping so you can see where your photos were taken. Nokia also announced that a Flipboard app is coming to Windows RT. Now there are two new Windows RT devices: Microsoft’s Surface and Nokia’s Lumia. However Nokia is being acquired by Microsoft and it will be interesting to see how the different product lines are managed by the combined company. Nokia’s former CEO Stephen Elop has announced the Lumia 1520 at an event in Abu Dhabi. The 1520 ($749) has a 6” screen which takes it into “phablet” territory. The larger size enables a 3rd column of live tiles, enabled by Microsoft with an update to the Windows Phone 8 operating system. Camera-wise the 1520 lacks the 41MP of the 1020 but does have a 20MP PureView camera. A new app called Nokia Camera has three camera modes including Still, Video, and Smart Mode which takes a burst of pictures. The app has a night mode optimised for low-light, and a sports mode for quick action shots. There is also a Pro Camera UI with all available settings and manual focus. A new Storyteller app integrates photos, images and maps. The 1520 also sports four microphones for “directional stereo”. This is also a large-screen model but with a 5MP camera and a more affordable price. An update to the OS called Lumia Black is coming to all Windows. With Windows Phones getting bigger, how is the OS differentiated from Windows RT? Well, one is a Phone OS and the other a tablet OS, but convergence cannot come soon enough. Elop also announced improvements to the Asha range of budget phones aimed mainly at emerging markets. The new models are the Asha 500 ($69, dual sim available, 2MP camera), 502 ($89, dual sim available, 5MP camera with flash) and 3G 503 ($99, dual sim available, 5MP camera with flash). You can share photos to social media including newly announced WhatsApp Messenger support from next month. Of course there was also the 2520 tablet, but that is the subject of a separate post. 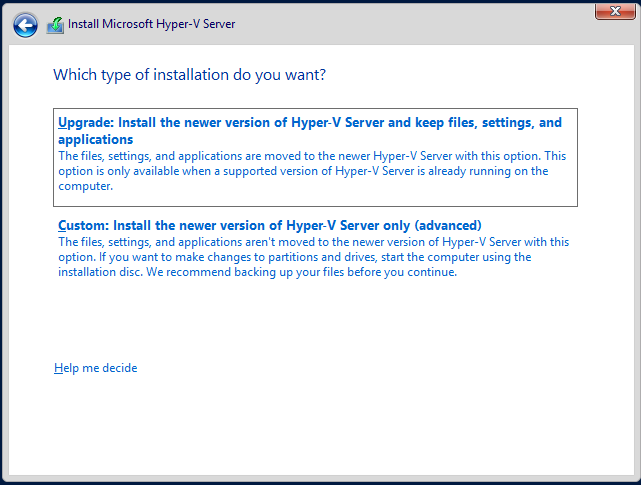 I have a couple of servers running Hyper-V Server, the free version of Microsoft’s hypervisor. The fix was trivial: remove the pass-through drive and then add it back. After that the VM started. Then I hit another problem. Although my VMs had started, they had no network connectivity, even after I upgraded the integration components. 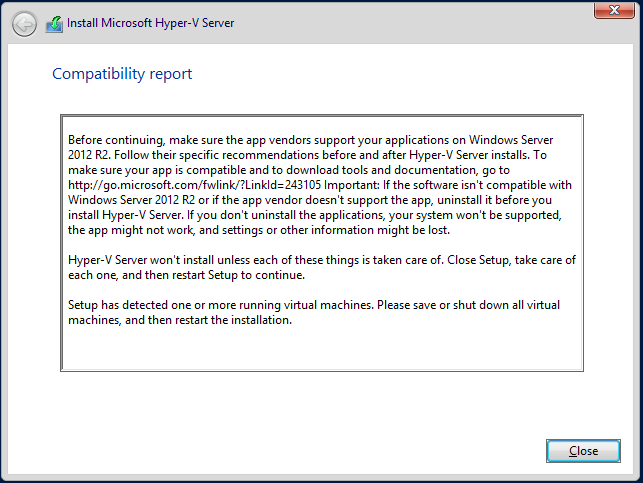 These VMs run Server 2008 R2, in case that makes a difference (I doubt it). 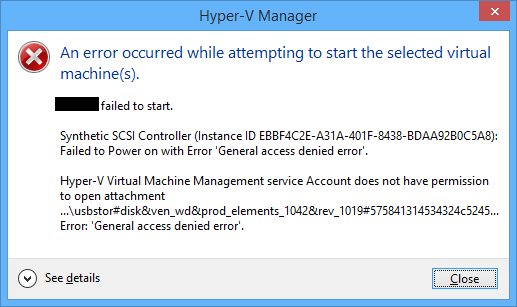 The virtual switch still showed in Hyper-V settings but no traffic passed through to the VMs. I tried two solutions. Removing the NIC from the VM and re-adding it made no difference (and this is also a poor solution since you then have to reconfigure the NIC in the VM). However deleting the virtual switch and replacing it with a new one of the same name and configuration was successful. The virtual NICs then have to be reconnected to the new virtual switch, but this is painless. Is it better to avoid in-place upgrades? A clean upgrade is safer, if you do not mind exporting and re-importing the VMs, or moving them all to another host, before the upgrade. On the other hand, with the upgrade cycle now faster than before, in-place upgrade makes sense as a way of keeping pace with little pain. Windows tablets present a design challenge because they include desktop applications which are designed for keyboard and mouse, rather than touch – not least Microsoft Office, which for some of us accounts for a significant proportion of the time spent using the device. So far there has been consensus therefore that Windows tablets need some easy way of using a keyboard and mouse or trackpad. How to achieve this without losing the benefits of a tablet is not easy. Bluetooth is one solution, but means three devices rather than one in your bag. Screens that twist over to form tablets are another, but the devices tend to be heavy and the twisting action inconvenient. Detachable keyboard/trackpads are the favoured solution, but leave you the problem of a loose keyboard to look after once you have detached it. If it stays always attached, perhaps you should have bought a laptop. Microsoft’s Surface tablet has the most elegant solution I have seen. When it was launched a year ago, it included two optional keyboard covers. The Type cover is a thin keyboard with real clacky keys. The touch keyboard is almost flat, though the keys are slightly raised. You can detach them, but they fold back behind the device, automatically disabling the keys, at which point they are unobtrusive. Many people liked the idea of the touch keyboard, but found typing frustrating with more errors than they normally make. For this reason, the Type keyboard is more popular among Surface users. It is possible that more Touch keyboards were sold, since they are slightly cheaper and more often bundled with the device, but in actual use I see more Type keyboards. That is a shame, because the Touch keyboard is design-wise a better solution. It adds very little bulk to the Surface, and when folded back under the device for tablet use, it feels perfectly natural, whereas the Type keyboard feels odd because of the keys that are then on the underside. When Microsoft announced the Touch Cover 2, it said that by adding more sensors (14 times as many apparently) and more intelligence to the cover and its drivers, it had improved the typing accuracy. As a Surface user I was excited to try the Touch Cover 2 and see if it lives up to these claims. If it does, I will happily ditch the Type cover. The Touch Cover 2 is the same price as before, £99 in the UK or $120 in the US. It is compatible with every Surface, including the original Surface RT. It is also fractionally thinner, 2.5mm as opposed to 3mm. Third, it is now backlit, which makes a big difference on those odd occasions when you are typing in dim light, such as on an aircraft when the cabin lights are dim. The new keyboard has function key labelling F1-F12. As is now common, the default is the non-Fn meaning, and you have to press Fn first to get the function key. The old keyboard also has an Fn key, but you have to work out which top key to press. The right Alt key is now labelled Alt Gr. The purpose of two of the special keys has changed. The new keyboard no longer has volume keys, though it does have a volume mute. In their place are two keys controlling the brightness of the backlight. The design of the trackpad has changed slightly. On the old touch cover, the left and right “buttons” are on the edge of the keyboard outside the etched area that represents the trackpad. On the new cover, these buttons are within the etched area, which means that the trackpad seems slightly bigger, but in reality is not. The underside of the touch cover used to have a fabric finish. On Touch Cover 2 it is now smooth plastic. This is one detail where I prefer the older cover, though maybe it helps to get it that 0.5mm thinner. Now for what really matters. How is the Touch Cover 2 in use? My first thought was to try a speed test. I went along to this online test and tried it several times with the old touch cover, then with the new one. The results favoured the new cover, perhaps by around 20%, though how you evaluate it depends on the weighting you give to errors versus speed. Then I sat down to write this review. This is where my opinion of the new Touch Cover began to swing in its favour. I find real-world typing on the Touch Cover 2 substantially more pleasant than with the earlier version. Measuring words per minute does not fully represent the improved experience. Of course this is a personal thing and your experience may vary. The backlighting is low key (ha!) but improves usability. The way this works is that the white lettering on the keys is illuminated so it stands out more. Note that if you think it is not working, you probably just need to increase the brightness using the special keys. Is it as good as a real keyboard, or even a Type Cover? I doubt it ever will be, especially if you are someone who does not look at the keyboard while you type. The problem is that the slight etching round the keys makes it harder for your fingers to know where they are, though typing with audible key clicks helps. Another factor is that if you are not at a desk, the lightness and thinness of the touch cover counts against it, since it flexes slightly on your lap. That said, with practice you can get good speed and accuracy. As a cover, it is so much more elegant than the Type Cover that overall I might just prefer it, even though I still rate the Type Cover slightly better for typing. One caveat though: I used the Touch Cover 2 with both Surface RT and Surface Pro, and had an annoying problem. If I stay typing in one app everything is fine, but if I switch apps than sometimes the keyboard stops responding. Oddly, opening Device Manager and pressing the up and down arrows a few times seems to fix it. Perhaps my Touch Cover 2 is faulty, but I suspect a driver issue, which means hope for a fix soon. I will be trying it soon with a Surface 2 and will be interested to see if the problem remains. The keyboard also seems to mark easily. I have only had it for a day, but can already see slight fading of the black finish on the keys I type most often. Mobility always involves compromise. If you want the very best keyboard for typing, it won’t be a touch cover. In fact, for best productivity I prefer a high quality Bluetooth or USB keyboard to either of the Type or Touch covers. That does not detract from what Microsoft’s engineers have achieved with the Touch Cover 2. Flip it back, and you have a tablet; flip it forward, and you protect your screen; place it on a desk and you have a productive typing machine. Glitch aside, I recommend the Touch Cover 2 as a good option with a new Surface and a worthwhile upgrade from the first Touch cover.